Herbert Morgan received a standing ovation honoring his service, at Tree of Love lighting ceremony. 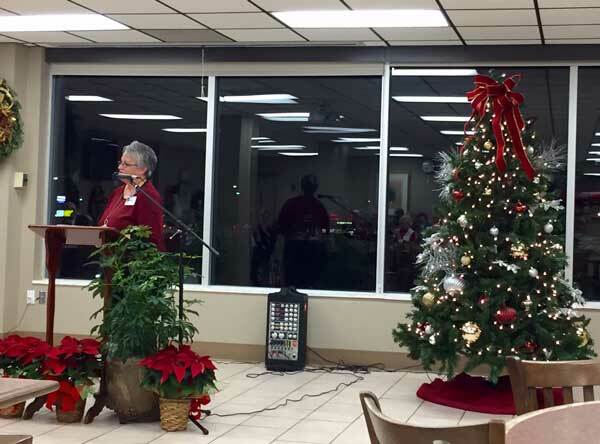 This is the 24th year a Tree of Love has been lighted to honor the volunteers who serve at Baptist Memorial Hospital-Union County. That according to Baptist CEO Walter Grace. 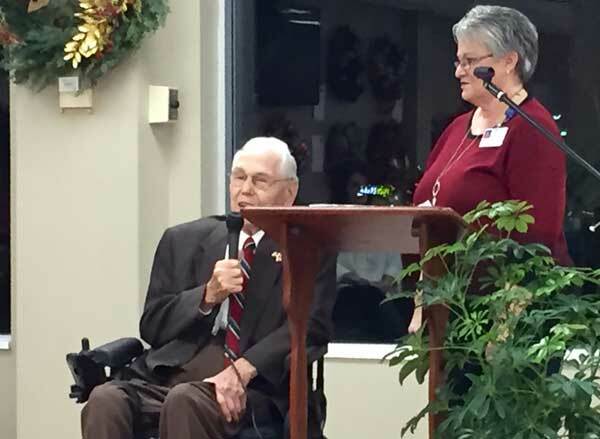 Reba Dunson of Baptist Hospital looks on as Herbert Morgan speaks. Herbert Morgan is the volunteer to whom this year’s 2017 Tree of Love is dedicated. Morgan received a spinal cord injury during combat in Europe with U.S. military forces during World War II. He spent 18 months in army hospitals in 1945 and 1946 and is confined to a wheelchair. In spite of his injuries Morgan has lived a productive life as a family man, volunteer and churchman. 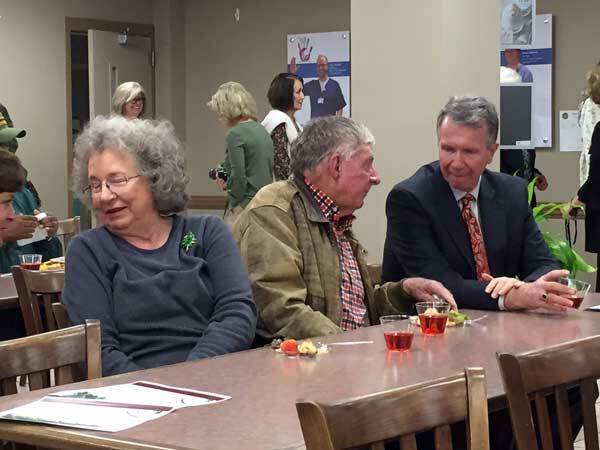 He served as Veteran Services Officer for Union County for over 30 years. Among his many volunteer activities had been assisting hundred of people in preparing their income tax returns and without charge. Reba Dunson threw the switch to light this year’s Tree of Love and introduced Herbert Morgan, to whom this year’s tree is dedicated. Rev. 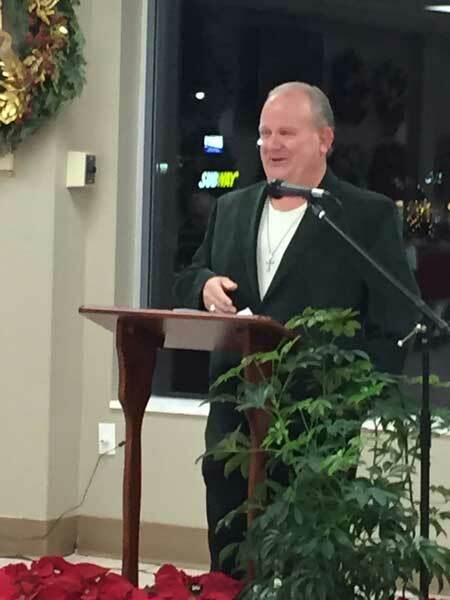 Ricky Bishop spoke during the Tree of Love ceremony Monday. 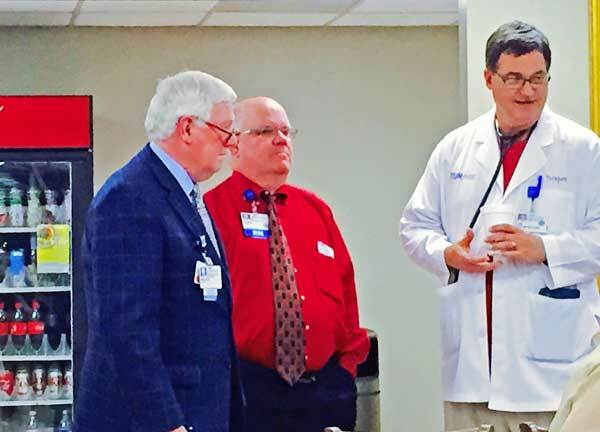 CEO Grace said Baptist volunteers have raised “more than $212-thousand” for hospital needs. Grace said money raised by volunteers has ranged from $88 spent one year on stuffed animals for children to more than $20,000 spent this year on “crash carts” for the hospital. Crash carts are secure, multi-drawered carts used to store special emergency drugs and equipment on site at nursing stations, operating rooms, clinics, emergency department, etc. They provide immediate access to life-saving medications which may be needed for cardiac arrests and other emergencies. Visitors chat at ceremony for Tree of Love. City Board considering closing the alley from Main St. to Bankhead St.
School is in session: Please follow these school bus safety tips!